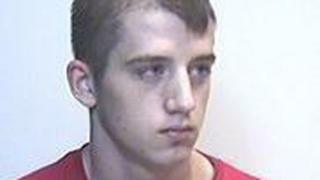 Two men have been sentenced for the attempted murder of a Chinese takeaway owner in Edinburgh. Gary Reid, 19, and James Hogg, 24, last month admitted attacking Jie Yu, 38, near his restaurant in Edinburgh's Pilton area on 1 October 2014. He had been trying to stop them stealing his car. At the High Court in Aberdeen, Reid was sentenced to seven years in a young offenders institution and Hogg was jailed for eight years three months. Mr Yu suffered a near fatal neck wound in the attack. Reid is the younger brother of John Reid, who was jailed in 2010 for the high-profile killing of Chinese takeaway driver Simon San in Edinburgh. Reid and Hogg had stolen Mr Yu's delivery vehicle from outside his Peking Garden takeaway after he left the keys in the ignition. Mr Yu then chased after the men on his daughter's bike, unaware they were both armed with knives. When he caught up with the pair and confronted them, he was repeatedly stabbed by both men in what was described in court as a "vicious and unprovoked attack". Reid and Hogg both pled guilty to attempted murder when they appeared at the High Court in Glasgow last month. Reid admitted his behaviour was racially motivated. The judge Lord Burns said that such was their "capacity for violence" that they will both be kept under supervision after they have served their time behind bars to protect the public. He said: "You have both pled guilty to the most vicious and unprovoked attacks on a man who was simply attempting to recover his own property which had been stolen from him. "You went out with two knives and you did attempt to murder the complainer. "The whole episode is characterised by gratuitous violence on our streets which will not be tolerated." The court had heard Mr Yu was on his way to make a takeaway delivery - but left the car engine running as he ran back inside to pick up a bottle of juice he had forgotten. Reid and Hogg were in a kebab shop next door to the takeaway. The court heard Reid, who is being held at Polmont Young Offenders Institution, had brought two knives with him and gave one to Hogg. At the High Court in Aberdeen it was Hogg, who was listed in court papers as being a prisoner in Edinburgh, who made the "spur of the moment" decision to steal the idling car. Mr Yu was treated at Edinburgh Royal Infirmary and St John's Hospital for 10 days. He is still recovering at home, according to police. Reid was previously sentenced to 14 months for assault and robbery in 2013. He will serve an extended sentence of two years when he is released. Hogg, who has previous convictions including a 42-month jail stint imposed in 2007, is to be released on licence for a period of three years. Det Insp David Pinkney, of Police Scotland, said: "Reid and Hogg targeted a well liked and respected member of the West Pilton community in their brutal attack. "I hope these sentences brings Jie Yu and his family some sense of closure and that they, and the community of West Pilton, can finally move on from this horrific attack."